So, folks, I guess it's true - Trenton Lee Stewart is writing a prequel to the Mysterious Benedict Society books. It will be entitled, "The Extraordinary Education of Nicolas Benedict." Here's an article about it. My friends, I don't know about this. Once stories are written because of publicity and hype, they tend to go downhill rather quickly. MBS is FANTASTIC and I LOVE it and I'm totally content with their only being three books in the series. Three solid books. But we'll see. We'll see. I'm nervous, but we'll see. I suppose I'm grateful that it's written by Stewart instead of someone else who just wants to build on a story they didn't feel was complete or wanted to extend in some ridiculous direction. At least the story will remain pure to the author's original intent. That's something to be grateful for. So what do you think? You ready for it? 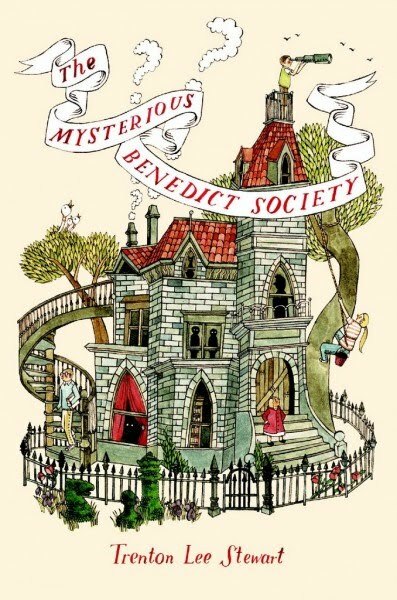 You now have 1 1/2 years (from the time of this post) to read the Mysterious Benedict Society series. And you know that I'll be around to keep reminding you of this fact until you do it. ;) heh. Very interesting. I'm looking forward to it. You're like the newsboy on the corner, because I hadn't heard this before! I'm very excited- I think there's a whole lot that can be told on this storyline! I have mixed feelings...and hope he can make a great book for all (meaning adults too) to enjoy! I just know that prequels tend to disappoint me. I preview all of the books my son reads, and the first MBS was one of them. I zoomed through that book in a day and couldn't wait for him to get started with it. We were so excited there was a second one (at the time, number three was not written), and elated when the third came out. I am up for another book, just to get more from this author. I think it will be interesting. I am going to be positive and hope for the best! It's the first I've heard about it...but I'm nervous, too! We'll see, right? Hmmm... I tend to agree with you. We shall see. Hmmm---I also hadn't heard this. I am not generally a fan of prequels, nor is my target-age daughter. I also do not think that the last book ended in a final way. Amanda said it was, but I really thought that we could have revisited the MBS in the future, or they could get involved on another quest. Jennifer - yeah. In that article I linked to Stewart "admittedly" said that the series wasn't necessarily final with Book 3. So I'd almost rather the kids go on another adventure than trying to back up. I'm in the middle of book 3 and so excited. I to hope that it doesn't go down hill. There's also another book that I have not read yet. It's called "Mr. Benedict's Book of Perplexing Puzzles, Elusive Enigmas, and Curious Conundrums."